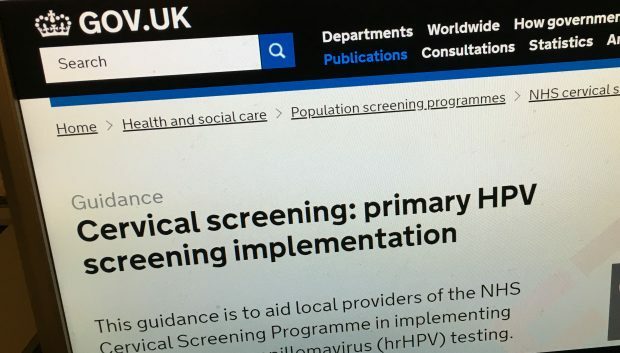 We have published new guidance for local cervical screening providers on implementing high-risk human papillomavirus (hrHPV) testing as the programme’s primary screening test. This builds on and replaces the short term mitigation guidance for providers implementing primary HPV screening to support cytology backlogs and the 14-day turnaround time standard, which means that all women should receive their screening result within 2 weeks of their test. The implementation of primary HPV screening is a major change. It impacts on all elements of the programme and requires significant service redesign. The new implementation guidance draws on experience from pilots. Providers should use the document to support the process of implementing primary HPV screening. This includes services implementing as part of NHS England’s resilience plans. Detailed guidance for laboratory and colposcopy providers will be published in due course. How are the laboratories and cytology staff going to be informed of which labs are successful/unsuccessful in bidding for HPV Primary screening? Hello - thank you for getting in touch. PHE is not responsible for procurement - this is a question for NHS England to respond to. Are we able to have some idea of the expected % increase in referrals to colposcopy please? Are there going to be any reports/stats published from the pilot sites? The main findings from the HPV primary pilot are expected to be published in the next few days. Look out for our upcoming blog which will provide further information. I am afraid this information perpetuates the fallacy that all low grade referrals can be put back to 36 month recall if there is no disease detected at colposcopy. A result category of hpv +ve with grade 9 cytology - borderline changes in endocervical cells - puts a woman at 70% risk of CIN2+ and most likely at least CGIN - yet this is managed in the low grade pathway! The correct protocol should be that if a woman referred with this result category does not have disease detected in colposcopy then discussion at MDT including cytology review must be implemented. Failure to follow this pathway leaves the woman exposed to development of significant disease for 3 years. In line with NHS Cervical Screening Programme guidance document number 20, Colposcopy and Programme Management, women referred with borderline changes in endocervical cells who have no abnormality detected at colposcopy and/or histology must have their case discussed at multi-disciplinary team (MDT). Amendments have been made to the implementation guide for primary HPV screening to clarify this requirement.